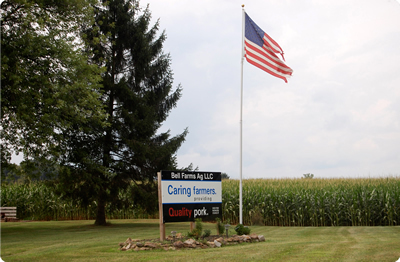 The Bell Family Farm is a sixth-generation family farm located in Zanesville, Ohio, just one hour east of Columbus. Our farm consists of a farrow to finish hog operation, as well as our corn and soybean crops. In 2010, we were fortunate to add Southeastern Ohio Genetics and Todd Himler to our farm and we have incorporated the proven breeding and show base that Todd has developed over the past 20 years into our existing herd. We know that the road to the showring can be full of twists and turns. We want to take some confusion out of the experience by providing your family with quality show stock. Take a look at what we have to offer, and we'll see you in the winner's circle!. Bell Farms is on Facebook! Click below to "like" us!